A few days ago we met María Ángeles Medina Martínez to discuss healthcare mobile app development and get to know her experience as a health specialist who has worked in the process of developing a healthcare application. We talked with her about the app project Esporti Revolution, an app in which she is working as Medical Director. Among the answers and all the information given to us by María Ángeles Medina, we must highlight that the role of the health professional − be it as a consultant or as the deviser of an application − is very important within the process of developing a mHealth app such as Esporti Revolution. But what kind of health professionals may act as consultants during the development process of a healthcare app? Medina, a Doctor of Medicine, is very clear about this. During the interview, she pointed out that her professional profile has always focused on the digital world. In fact, as she told us, it seems that working in the creation of a mHealth app has been the logical consequence of this. “I am a family physician, but I’ve always had quite a 2.0 sort of profile”, she explained to us at the very beginning of our conversation. 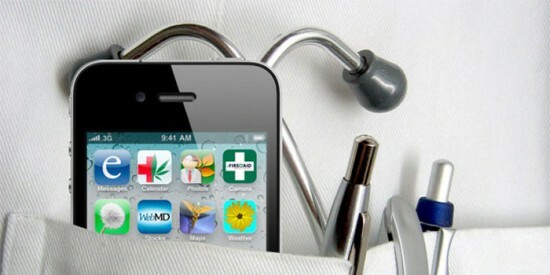 However, creating this kind of apps is not limited to health professionals. Groups such as patient associations − patients themselves as experts in their disease − may be the initiators of developing a mHealth app, provided that they are committed to the project and receive clinical advice. As for the idea behind the app, it emerged in the same way many others do: by identifying a gap in the market. “I had a colleague who was very concerned about childhood obesity cases, and that’s what gave me the idea,” told us María Ángeles Medina. And taking this as a starting point, she took the leap into constituting a company, Healthy Blue Bits, created to provide software solutions for children’s health. Who gets involved in the mobile app development process? When being asked what kind of professionals get involved in mobile app development you know very well that the answer may depend. It depends on many things, such as whether it’s a specialised app or not. 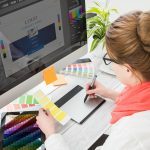 For example, for an app dealing with gastronomy, a cook or a chef will be needed for advice throughout the process or at least when establishing the business proposal and the business project. In this case we are discussing healthcare app development, so we’ll need a health professional who knows the field well and can approve the app’s content from the medical point of view. It will also depend on the size of the project, as an app that advises on good practices and an app that’s purely informative are not the same. Similarly, the development team doesn’t have to be extremely large if not required by the app. 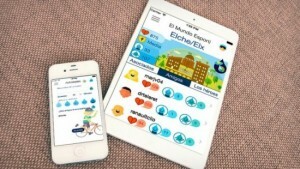 In the case of Healthy Blue Bits and Esporti Revolution, the team consisted of the Medical Director (María Ángeles Medina) and the Development Manager, who was responsible for both the programming and the app’s design in full. m-Health development: How do we coordinate with the health professional? At the very beginning of our interview, Doctor María Ángeles Medina told us that it’s absolutely necessary that health professionals participate actively in the development process of healthcare and mHealth apps. The “total involvement of the health professional in the project is necessary”, points out the expert. Especially in applications with a clinical orientation. But she also recognises that this relationship is not always easy. “Some professionals are reluctant to participate in the development process of this kind of apps. It’s hard for them to change their minds about it. However, we cannot stay behind our patients. If they are already using these apps, we must keep up with the pace”, explains Medina during the interview. This initial rejection by health professionals seems to be warning, as the number of healthcare applications in the markets increases. And the key to an app being safe and rigorous from the clinical perspective − two essential characteristics in healthcare applications − is that there is a good communication between specialist and developer. If the communication is clear and concise when conveying and defining a good mobile application project, it will not even be necessary for the health professional to have notions on mobile app development or app design. How do I know if my m-health app is useful? This case is not the same as when developing an app to make money, where we establish from the very outset that the purpose is its monetisation. On the contrary, very often the return on investment (ROI) when developing a healthcare app is expected to be of other nature. In many cases the ROI is of human nature, i.e. changing human behaviour or promoting a change in the app’s users. This becomes very clear in the case of Esporti Revolution. The app’s utility and its ROI focus on reducing childhood obesity. The purpose is different, despite the fact that to cover the development costs we may include some monetisation strategy − something that also happens with Esporti Revolution. In these cases, how can we determine if our app is really useful? Once more we get back to a recurrent answer: by analysing it. It’s nothing new. We have already discussed more than once the paramount importance of analysing what’s happening in our app. We will analyse a wide range of things: mobile user, user movement, etc. In short: we’ll find out what are users doing the most and what isn’t working in order to fix it and improve our app. “We are conducting a clinical study in which 36 paediatricians and 200 children with childhood obesity are participating. And the results are good: children are losing weight and there are no adverse effects due to the application’s use”, told us María Ángeles Medina on the impact analysis of its mobile app.